Christopher Alvin Stapleton (born April 15, 1978) is an American singer-songwriter and guitarist. Stapleton's music styles include Southern rock and bluegrass. He is an established songwriter with six country number-one songs including the five-week number-one "Never Wanted Nothing More" recorded by Kenny Chesney, "Love's Gonna Make It Alright" recorded by George Strait, and "Come Back Song" recorded by Darius Rucker. Over 150 of Stapleton's songs have appeared on albums by such artists as Adele, Luke Bryan, Tim McGraw, Brad Paisley and Dierks Bentley. Among other artists, he has co-written with Vince Gill, Peter Frampton and Sheryl Crow. After serving as the frontman of bluegrass group The SteelDrivers from 2008 to 2010, Stapleton released his debut studio album Traveller in 2015, which reached number one on the US Billboard 200 and was certified double platinum by the Recording Industry Association of America (RIAA). Among several accolades, he won the Country Music Association Awards and the Academy of Country Music Awards for Album of the Year and Male Vocalist of the Year, and the Grammy Award for Best Country Album and Best Country Solo Performance at the 58th annual ceremony. His second studio album, From A Room: Volume 1 was released on May 5, 2017, reached number two on the US Billboard 200, and to date has surpassed 500,000 units sold. Six months later, Stapleton released follow-up album, From A Room: Volume 2, which, like its predecessor, debuted at number two on the US Billboard 200. Stapleton was born in a Lexington, Kentucky hospital. His mother worked at the local health department and his father was a coal miner. He comes from a family of coal miners. He has an older brother and younger sister. 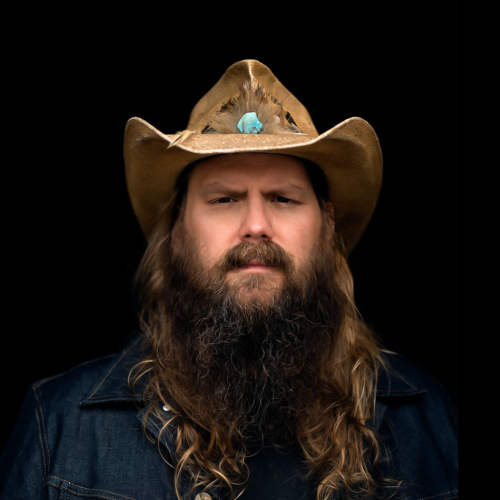 Stapleton grew up in the small town of Staffordsville, Kentucky, which is located just outside of Paintsville, located between the city and the Paintsville lake. He graduated from Johnson Central High School where he was his class valedictorian and attended Vanderbilt University where he studied engineering, but dropped out after a year. Stapleton is married to singer-songwriter Morgane Hayes, who co-wrote Carrie Underwood's 2006 single "Don't Forget to Remember Me". She had a recording deal with Arista Nashville. The couple met when they were working at adjacent publishing houses. They have two children and live in Nashville.